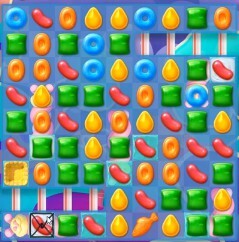 Candy Crush Jelly Level 161 requires that you crack all the frosting in 25 moves and find 7 pufflers. The pufflers are trapped beneath the frosting and thus you must come up with a strategy that will crack the frost with the fewest moves possible. ;Clearing the frosting left after using the stripped candy is easy since you can crack them by a single candy effect. The most efficient method of cracking this frost in the fewest moves possible is by the use of special candies formed. All the special candies including color bombs and wrapped candies and their combinations will do an excellent job in clearing the frost. This will make it easier to find the pufflers and allow you to beat Candy Crush Jelly Level 161 easily.